A collaborative study by New Mexico Tech and the Alaska Volcano Observatory. This site presents observations of the electrical activity during the eruptions of Mt. Redoubt, Alaska. After becoming seismically active on Jan 25, 2009, Mt. Redoubt started producing a series of explosive eruptions, beginning on March 23 06:38 UTC (March 22 10:38 AKDT). Working in conjunction with the Alaska Volcano Observatory (AVO), and with support by the U.S. National Science Foundation (NSF), lightning researchers at New Mexico Tech quickly deployed a network of four portable lightning mapping stations along the Kenai Peninsula coast on the opposite side of Cook Inlet from Redoubt. The lightning mapping stations are located at Nikiski, Kalifornsky Beach (K-Beach, just south of Kenai), Clam Gulch, and Ninilchik. Each station listens for radio frequency signals produced by electrical discharges and lightning produced during the volcanic eruptions. The radio signals are received in a locally unused VHF television channel, Channels 3 and 2. Because clouds are transparent at radio frequencies, the observations detect the lightning and electrical activity both inside and outside the volcanic plumes and in inclement weather conditions when the eruption is not seen visually. In addition to measuring the strength of the radio signals, the mapping stations accurately determine the time impulsive radiation events arrive at the different locations. These measurements can be used to map out the structure and development both of individual lightning discharges and of the overall electrical activity of the eruption. Below we show an example of the observational data obtained for one of the eruptions. Data for other eruptions can be viewed on the links. How to read the plots: The figures below show lightning mapping results for one of the explosive events on 23 March 2009. The data are shown in plan position, i.e. what one would see if viewed from above. The bottom figure shows an animation of the lightning sequence. Left plot: This figure is scaled so as to show the location of the electrical activity in relation to the locations of the lightning mapping stations. The four green squares on the east side of Cook Inlet indicate the locations of the stations, while the coastline is drawn in gray. Also plotted is a shaded topographical map of the Redoubt area. Dark purple indicates the lowest elevations and blue marks the highest elevations. The lightning sources are color-coded by time, ranging from blue (earliest times) to red (latest times). The triangles and diamonds (which are also color-coded by time) are indicative of the approximate locations of lightning ground strikes. 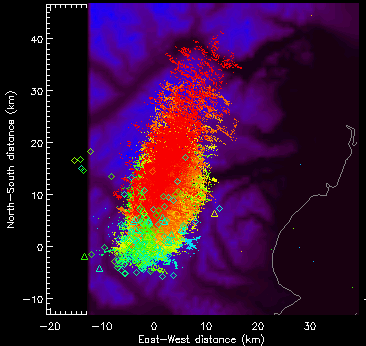 Middle plot: This figure shows a close-up of the entire lightning sequence. Each VHF lightning source is plotted as a single point. An entire discrete discharge may contain as many as 1000 VHF sources, or as few as 10. The lightning from this eruptive event contains hundreds, or possibly thousands of discharges. The small size of many of the discharges and high frequency of the sources makes it difficult to discern separate, discrete discharges. During this explosion, the electrical activity begins over the volcano, coincident with the onset of the the explosion. The activity persists for about 40 minutes; during this time the lightning migrates about 40 km NNE of Redoubt. Right plot: This plot is presented here to show the location of Redoubt relative to the electrical activity. This plot has the same scale as the middle plot. 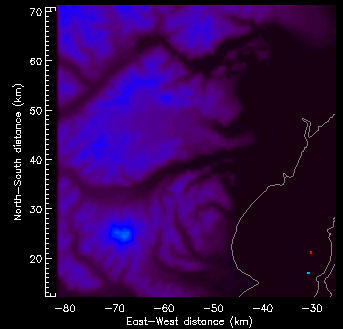 Redoubt is the small and isolated blue feature in the lower left corner. Bottom plot: This plot shows the animation of the lightning sequence. Top graph: This shows the peak power of the VHF radio signal received at the antenna. The colors indicate the intensity of the electrical activity, with red being the most intense and purple the weakest. The vertical lines are the signals from discrete lightning flashes, which typically last from about .010 seconds (10 milliseconds) up to 1/2 second or more. During the explosion itself there is a myriad of sparks of different sizes, which blend together to produce a continuous background color. Subsequent to the explosive phase, lightning and sparks of different sizes and strengths continues to be produced in the volcanic plume. As the eruption starts to fade out, the lightning frequency decreases into occasional (but extensive and long duration) discharges. Middle graph: This indicates the fraction of the time the received signal was above the threshold value for recording data. A value of 250 indicates that the signal was above the threshold 100% of the time. Bottom graph: This plot shows the difference in arrival time between successive recording 'triggers.' Again, the colors correspond to the density of points, with red being the most dense and purple the least dense. This plot is very helpful in highlighting when the continuous VHF radiation is occurring. For example, in the image below there is a streak of orange and red near the bottom of the plot. This indicates that there was a large number of signals that all arrived within a very short time of each other (10 microseconds - the duration of successive measurement 'windows'), and signals a continuous radiation or eruptive phase. These plots actually show a series of two explosive events. According to seismic data, the times of the first and second explosions were 09:39 UTC (01:39 AM AKDT) and 09:48 UTC (01:48 AM AKDT). Both explosions sent plumes up to about 12.1 km in altitude. There was a phase of amorphous and random activity directly over the vent following the onset of each explosion. The first phase began at roughly 09:41:40 UTC, almost 3 minutes after the official start of the first explosion. This activity had a duration of about 2.5 minutes. The second phase of amorphous activity began at roughly 09:53:50 and only persisted for one minute or less. Here is a list of all the electrical activity that has been recorded since Redoubt began erupting on March 22, 2009. All of the electrical activity is associated with seismic events of varying magnitude. 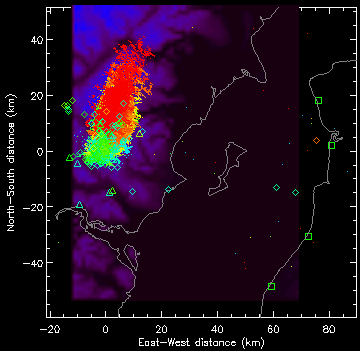 Explosions that produced plumes higher than 10 km also produced large amounts of lightning. Explosions that produced plumes lower than 10 km produced either a very limited amount of discrete lightning or no lightning at all. Click on the links below to view LMA observations of the event. The plume heights and total duration of electrical activity are noted below, if available. Also noted is whether or not animations of the lightning sequences are included on the linked pages.